St. Mary Magdalen -- the Myrrh Bearer, the Penitent, the woman whose story tells us more than any other in Scripture of the mercy of God -- is an inspiration to all, especially to women whose lives before conversion were once filled with sin. But so much confusion and agenda-driven obfuscation have arisen about our Saint! What do we know of her from Sacred Scripture? that her name comes from the word "Magdala" (Hebrew, literally, for "tower" or "fortress"), either referring to the name of the town (also known as Taricheae) where she may have been born, or from the euphemism (seen in the Talmud) for "curling women's hair" which designates an adultress. that Mary is described as one who had annointed Our Lord's feet with ointment from an alabaster box and then wiped His feet with her hair (John 11:1-45, c.f. Luke 7:36-50) and that she annointed them again (with ointment made of spikenard, 1 kept in an alabaster box 2) in Bethany, just before the Last Supper, an act about which Our Lord said, "...she is come beforehand to anoint my body for burial. Amen, I say to you, wheresoever this gospel shall be preached in the whole world, that also which she hath done, shall be told for a memorial of her." (Matthew 26:6-13, Mark 14:1-9, John 12:1-8). So what is all the clamor about? The first issue of contention is the Church's identification of "the sinner" of Luke 7:36-50 with Mary Magdalen. And one of the Pharisees [Simon] desired him to eat with him. And he went into the house of the Pharisee, and sat down to meat. And behold a woman that was in the city, a sinner, when she knew that he sat at meat in the Pharisee's house, brought an alabaster box of ointment; And standing behind at his feet, she began to wash his feet, with tears, and wiped them with the hairs of her head, and kissed his feet, and anointed them with the ointment. And the Pharisee, who had invited him, seeing it, spoke within himself, saying: This man, if he were a prophet, would know surely who and what manner of woman this is that toucheth him, that she is a sinner. And Jesus answering, said to him: Simon, I have somewhat to say to thee. But he said: Master, say it. When Mary Magdalen came to the tomb and did not find the Lord's Body, she thought it had been taken away and so informed the disciples. After they came and saw the tomb, they too believed what Mary had told them. The text then says: "The disciples went back home," and it adds: "but Mary wept and remained standing outside the tomb." We should reflect on Mary's attitude and the great love she felt for Christ; for though the disciples had left the tomb, she remained. She was still seeking the One she had not found, and while she sought she wept; burning with the fire of love, she longed for Him Who she thought had been taken away. And so it happened that the woman who stayed behind to seek Christ was the only one to see Him. For perseverance is essential to any good deed, as the voice of truth tell us: "Whoever perseveres to the end will be saved." it attempts to undermine the authority of the Church and paint Her hierarchs as "woman-haters"
But these modernist critics forget that everything we can know about Mary comes from Scripture and Sacred Tradition (their Gnostic "gospels" were written hundreds of years after Christ). They forget that the Church recognizes that St. Paul had been a murderer of Christians -- surely more of a sin than Mary's promiscuity -- and he is honored above all apostles but St. Peter! They forget that we hold Mary in such great esteem that we celebrate her Feast, name churches for her, and build shrines in her memory! And misogynist? It is funny how Catholics are accused by some of "hating women" while Protestants accuse us of "worshipping" one! Mary's story of redemption and grace is very important and relevant to today's world, a world in which such sinful behaviors are seen as normal and good. Mary's story gives hope to all who have dark pasts that Christ, the Divine Physician, heals and redeems. Alleluia! Today is a good day, then, to ponder Christ's mercy, to recall the sins of your life and how you are forgiven of them through the Sacrament of Penance. There are two distinct legends that speak of Mary's life after Our Lord ascended into Heaven to sit at the right hand of the Father. The Eastern tradition maintains that she went to Rome, and then to Ephesus with Our Lady, where she died. Her relics were taken to Constantinople in the 9th c., to be translated later to Rome and France. The Roman tradition is that, in A.D. 48, she -- along with SS. Martha and Lazarus -- were seized by the Jews of Palestine who put them on a rickety boat without any oars and cast them away into the stormy sea. They made their way to France, and once there, settled in and converted all of Provence. While St. Martha gathered about her a community of women, and while St. Lazarus became a Bishop, Mary is said to have retired to a cave in a hill in La Sainte-Baume to live a life of penance for thirty years. When she was dying, the angels are said to have carried her to the Oratory of St. Maximinus in Aix where she received Viaticum and died. Her body is said to have been deposed in St. Maximin Oratory in Villa Lata until A.D. 745, when she was moved to protect her relics from the Saracens. Later, when the Dominicans built a convent in La Sainte-Baume, the shrine was found intact, with an inscription indicating why the relics were hidden. This church was destroyed during the French Revolution, but was later restored, and the head of Mary Magdalen is said to be there to this day. St. Mary Magdalen is the patroness of penitents, reformed prostitutes, perfumers, hairdressers, and apothecaries. She is usually depicted artistically in a posture of penance or an attitude of reflection, annointing Our Lord's feet, at the Foot of the Cross or before a Crucifix, at the empty tomb, meeting the risen Christ (often with the words "Noli me tangere" -- "Touch Me not" -- in the painting), being fed Viaticum at death, or carried by angels after her death. She is symbolized by her alabaster jar; a skull symbolizing penance and acting as a memento mori; a mirror; long, unveiled hair (often red); tears; red robes; and an egg (especially a scarlet one; see the Easter page). For those interested in perfumery and essential oils, the blending of oils and making of ointments as gifts or for personal use, all in honor of Mary, is a natural for this day. Perfumes, massage oils, healing ointments -- all of these are easy to make (see footnote 3). Food-wise, there are Proust's famous madeleines (French for "magdalens"), a light, cake-like, shell-shaped cookie that require a special madeleine pan to make. Butter 2 madeleine molds (molds of 12) and put into the refrigerator. Butter them again in 15 minutes, making sure the butter coats the indentations on the top. Chill molds until ready to use. Grate the zest from 1/2 of the lemon and reserve. Squeeze the lemon and reserve the juice. Whisk the flour and baking powder together. Melt the butter and set aside. Whisk the eggs, sugar, lemon zest and lemon juice together for about 30 seconds. Don't overmix. Thin the mixture with 1/2 cup of the milk. Add the flour all at once and, using a whisk, blend just long enough to eliminate lumps. Gently stir in the rest of the milk and the melted butter. Refrigerate the batter for 20 minutes. Preheat oven to 425�. Spoon the batter into the shell-shaped molds and bake for 15 to 20 minutes, turning the pans halfway through the cooking time so they bake evenly. Immediately remove the cookies from the molds and allow to cool on racks. Sprinkle with powdered sugar just before serving (not when hot!). One final note: an old English saying is that if it rains today, it is Mary Magdalen washing out her handkerchief, preparing to attend St. James's fair. The Feast of St. James is a few days from now, on the 25th of July (her sister Martha's Feast follows hers in one week). As to readings for today, see St.Ephraem's "Homily on the Sinful Woman," and the prayer by St. Anselm below. 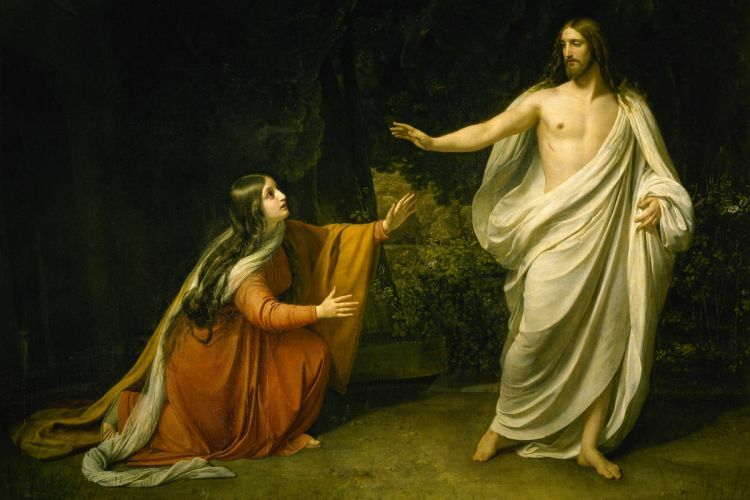 St. Mary Magdalene, you came with springing tears to the spring of mercy, Christ; from Him your burning thirst was abundantly refreshed through Him your sins were forgiven; by Him your bitter sorrow was consoled. My dearest lady, well you know by your own life how a sinful soul can be reconciled with its Creator, what counsel a soul in misery needs, what medicine will restore the sick to health. It is enough for us to understand, dear friend of God, to whom were many sins forgiven, because she loved much. Most blessed lady, I who am the most evil and sinful of men do not recall your sins as a reproach, but call upon the boundless mercy by which they were blotted out. This is my reassurance, so that I do not despair; this is my longing, so that I shall not perish. I say this of myself, miserably cast down into the depths of vice, bowed down with the weight of crimes, thrust down by my own hand into a dark prison of sins, wrapped round with the shadows of darkness. Therefore, since you are now with the chosen because you are beloved and are beloved because you are chosen of God, I, in my misery, pray to you, in bliss; in my darkness, I ask for light; in my sins, redemption; impure, I ask for purity. Recall in loving kindness what you used to be, how much you needed mercy, and seek for me that same forgiving love that you received when you were wanting it. Ask urgently that I may have the love that pierces the heart; tears that are humble; desire for the homeland of heaven; impatience with this earthly exile; searing repentance; and a dread of torments in eternity. Turn to my good that ready access that you once had and still have to the spring of mercy. Draw me to him where I may wash away my sins; bring me to him who can slake my thirst; pour over me those waters that will make my dry places fresh. You will not find it hard to gain all you desire from so loving and so kind a Lord, who is alive and reigns and is your friend. For who can tell, beloved and blest of God, with what kind familiarity and familiar kindness he himself replied on your behalf to the calumnies of those who were against you? How He defended you, when the proud Pharisee was indignant, how He excused you, when your sister complained, how highly He praised your deed, when Judas begrudged it. And, more than all this, what can I say, how can I find words to tell, about the burning love with which you sought him, weeping at the sepulchre, and wept for Him in your seeking? How He came, who can say how or with what kindness, to comfort you, and made you burn with love still more; how He hid from you when you wanted to see Him, and showed Himself when you did not think to see Him; how He was there all the time you sought Him, and how He sought you when, seeking Him, you wept. But you, most holy Lord, why do You ask her why she weeps? Surely You can see; her heart, the dear life of her soul, is cruelly slain. O love to be wondered at; O evil to be shuddered at! You hung on the wood, pierced by iron nails, stretched out like a thief for the mockery of wicked men; and yet, "Woman," You say, "why are you weeping?" She had not been able to prevent them from killing You, but at least she longed to keep Your Body for a while with ointments lest it decay. No longer able to speak with You living, at least she could mourn for You dead. So, near to death and hating her own life, she repeats in broken tones the words of life which she had heard from the living. And now, besides all this, even the Body which she was glad, in a way, to have kept, she believes to have gone. And can You ask her, "Woman, why are you weeping?" Had she not reason to weep? For she had seen with her own eyes -- if she could bear to look -- what cruel men cruelly did to You; and now all that was left of You from their hands she thinks she has lost. All hope of You has fled, for now she has not even Your lifeless Body to remind her of You. And someone asks, "Who are you looking for? Why are you weeping?" And indeed You know her well, the Gardener, who planted her soul in His garden. What You plant, I think You also water. Do You water, I wonder, or do You test her? In fact, You are both watering and putting to the test. But now, good Lord, gentle Master, look upon your faithful servant and disciple, so lately redeemed by Your Blood, and see how she burns with anxiety, desiring You, searching all round, questioning, and what she longs for is nowhere found. Nothing she sees can satisfy her, since You whom alone she would behold, she sees not. What then? How long will my Lord leave his beloved to suffer thus? Have You put off compassion now You have put on incorruption? Did You let go of goodness when you laid hold of immortality? Let it not be so, Lord. You will not despise us mortals now You have made Yourself immortal, for You made yourself a mortal in order to give us immortality. And so it is; for love's sake He cannot bear her grief for long or go on hiding Himself. For the sweetness of love He shows Himself who would not for the bitterness of tears. "I know who you are and what you want; behold Me; do not weep, behold Me; I am He whom you seek." At once the tears are changed; I do not believe that they stopped at once, but where once they were wrung from a heart broken and self-tormenting they flow now from a heart exulting. How different is, "Master!" from "If you have taken Him away, tell me"; and, "They have taken away my Lord, and I do not know where they have laid Him," has a very different sound from, "I have seen the Lord, and he has spoken to me." But how should I, in misery and without love, dare to describe the love of God and the blessed friend of God? Such a flavour of goodness will make my heart sick if it has in itself nothing of that same virtue. But in truth, You who are very Truth, You know me well and can testify that I write this for the love of Your love, my Lord, my most dear Jesus. I want Your love to burn in me as You command so that I may desire to love You alone and sacrifice to You a troubled spirit, "a broken and a contrite heart." Give me, O Lord, in this exile, the bread of tears and sorrow for which I hunger more than for any choice delights. Hear me, for Your love, and for the dear merits of your beloved Mary, and Your blessed Mother, the greater Mary. Redeemer, my good Jesus, do not despise the prayers of one who has sinned against You but strengthen the efforts of a weakling that loves You. Shake my heart out of its indolence, Lord, and in the ardour of Your love bring me to the everlasting sight of Your glory where with the Father and the Holy Spirit You live and reign, God, for ever. Amen. Joseph therefore arose, and taking Mary his spouse, went away to Jerusalem, and came to Bethlehem, to be enrolled along with his family in his native city. And having come to a cave, Mary told Joseph that the time of the birth was at hand, and that she could not go into the city; but, said she, let us go into this cave. This took place at sunset. And Joseph went out in haste to go for a woman to be near her. When, therefore, he was busy about that, he saw an Hebrew old woman belonging to Jerusalem, and said: Come hither, my good woman, and go into this cave, in which there is a woman near her time. Wherefore, after sunset, the old woman, and Joseph with her, came to the cave, and they both went in. And, behold, it was filled with lights more beautiful than the gleaming of lamps and candles, and more splendid than the light of the sun. The child, enwrapped in swaddling clothes, was sucking the breast of the Lady Mary His mother, being placed in a stall. And when both were wondering at this light, the old woman asks the Lady Mary: Art thou the mother of this Child? And when the Lady Mary gave her assent, she says: Thou art not at all like the daughters of Eve. The Lady Mary said: As my son has no equal among children, so his mother has no equal among women. The old woman replied: My mistress, I came to get payment; I have been for a long time affected with palsy. Our mistress the Lady Mary said to her: Place thy hands upon the child. And the old woman did so, and was immediately cured. Then she went forth, saying: Henceforth I will be the attendant and servant of this child all the days of my life. Then came shepherds; and when they had lighted a fire, and were rejoicing greatly, there appeared to them the hosts of heaven praising and celebrating God Most High. And while the shepherds were doing the same, the cave was at that time made like a temple of the upper world, since both heavenly and earthly voices glorified and magnified God on account of the birth of the Lord Christ. And when that old Hebrew woman saw the manifestation of those miracles, she thanked God, saying: I give Thee thanks, O God, the God of Israel, because mine eyes have seen the birth of the Saviour of the world. And the time of circumcision, that is, the eighth day, being at hand, the Child was to be circumcised according to the law. Wherefore they circumcised Him in the cave. And the old Hebrew woman took the piece of skin; but some say that she took the navel-string, and laid it past in a jar of old oil of nard. And she had a son, a dealer in unguents, and she gave it to him, saying: See that thou do not sell this jar of unguent of nard, even although three hundred denarii should be offered thee for it. And this is that jar which Mary the sinner bought and poured upon the head and feet of our Lord Jesus Christ, which thereafter she wiped with the hair of her head. 2 "Alabaster" is a usually white, translucent gypsum. Add about 4 to 10 drops of essential oils to 1 tablespoon of Jojoba oil (apricot kernel oil or grapeseed oil can be used instead, but these and other vegetable oils will go rancid. Jojoba keeps best. It is best to make these ointments as you use them, or at least not make very large quantities in advance.). In a 1-oz dark-colored bottle, mix 4 tsp Jojoba oil with 10-15 drops of essential oil. Cap tightly and let sit a week, shaking periodically and testing the fragrance, adding drops of whatever you think it needs as you go along and testing in a few days (it will develop as it sits). In a dark-colored bottle, mix 25 drops of essential oil with 1 oz of Vodka. Let age 2 weeks, shaking periodically and testing the fragrance, adding drops of whatever you think it needs as you go along and testing in a few days (it will develop as it sits). Heat together 1/4 cup Jojoba oil with 1/2 ounce beeswax. Off the heat, stir in essential oils, starting with 20 -30 drops. Play with amounts of wax and carrier oil to achieve desired texture. Pour into containers. It will develop over time. Heat together 2 parts Jojoba oil (or olive oil) with 1 part beeswax (or candelilla wax) until melted. Stir in food flavorings (1/4 to 1/2 teaspoon for every 1/4 cup of oil) and any healing oils desired. A capsule of Vitamin E can be squeezed into this mixture also. Pour into containers. Ratio of oil to wax can be played with to gain desired texture. Melt together a bit over a half ounce of Beeswax with 4 � tablespoons of Jojoba oil (half of this can be Calendula oil for more healing properties). Remove from heat, stir in contents of a Vitamin E capsule, and 40 drops of some combination of these: Lavender oil, Tea tree oil, Oregano oil, Roman or German Chamomile. Pour into tins to firm up. Use within 6 months. Put 1 cup sea salt and 1/2 cup Epsom salt into a bowl and blend. Seperately, mix 2 tablespoons baking soda with add 20-25 drops of essential oils (a few drops of vegetable food coloring may be added a few drops at a time, too, mixing well after each addition), and then add to the salts. Mix well with a fork and pack into a jar with a tight-fitting lid and shake. Let sit for a few days, shaking periodically. Add 1/4 - 1/2 cup to bathwater just before getting in the tub, and swirl to dissolve. To 1 cup of sea salt (or rock salt or mineral salt), add 3-5 drops of vegetable food coloring 2 drops at a time, shaking, shaking well after each addition). Add 20-25 drops of essential oil, and shake once more. Add a teaspoon of glycerine and the salts will gleam like jewels. Store airtight. Mix 2/3 cup baking soda with 1/2 cup citric acid crystals in a bowl. Add 5-8 drops of essential oil to 2 Tbsp. cornstarch (a few drops of vegetable food coloring can be worked into the cornstarch before adding), and add. Pack into airtight jars, and let sit a few days. Pour some into bathwater just before getting in the tub.